You are currently browsing the category archive for the ‘Swales & verge gardens’ category. Kangaroo paws like book ends are very effective. 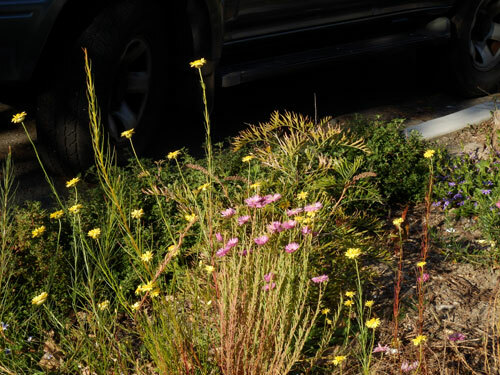 Yellow buttons is an Australian native ground cover that thrives on neglect. Nice to see that the kids have had a hand in adding colour and beauty too. The weather has been too hot to get out much, but there are some things I hope to get to this weekend. I have noticed more people are starting verge gardens. Any garden that breaks up the concrete landscape is good to my eyes, but some verge gardens significantly add beauty to the streetscape. I recently found one in Marrickville South that I thought was very nice. It went across two frontages. There was a community library as well, which had a chalkboard on the side for the kids to draw on. Every plant was a native. Red & yellow kangaroo paws were planted at each end & the flower stalks had not been vandalised. I chose not to plant these water-wise plants because I thought they would be vandalised. This garden has changed my mind. 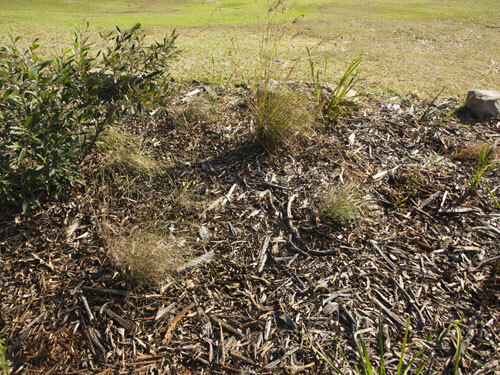 Another section with ground covering grevillea. 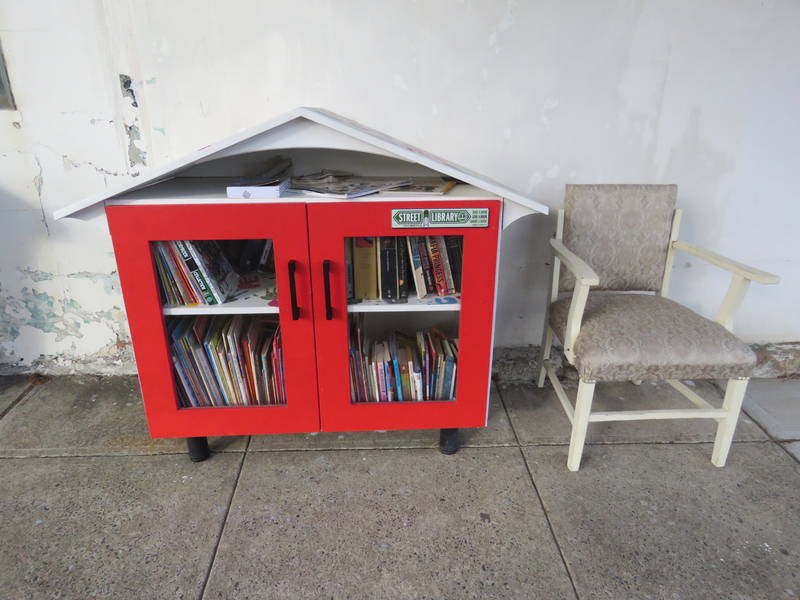 The street library. I love these things. Even a chair to sit and read awhile. This used to be a view to the railway line in Arthur Street until a local resident created something wonderful. Another section in Arthur Street Marrickville. A great improvement in my opinion. Last Saturday we attended the propagation workshop put on by Marrickville Council. We joined about eleven others at Marrickville Council Nursery for a lesson on propagating given by a Horticulturist from Ryde TAFE. She explained the benefits of propagating, then showed us how prune cuttings, how cuttings grow, as well as how to prepare & plant to get the best chance of survival. 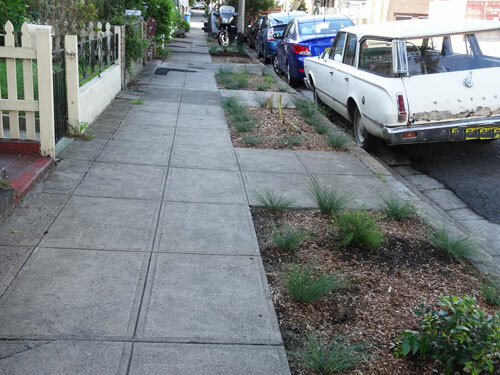 We then went on a bus trip around Marrickville to three verge gardens to get cuttings to start our own plants. 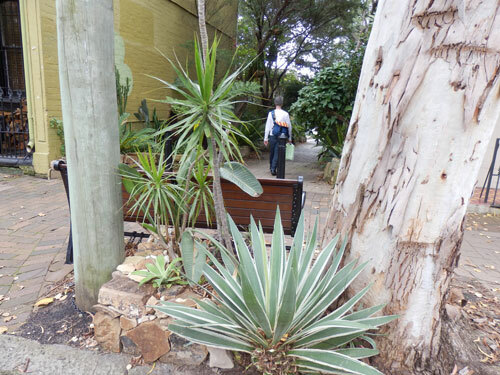 One of the verge gardens was in Riverside Crescent Dulwich Hill. I wrote about this in January 2013. 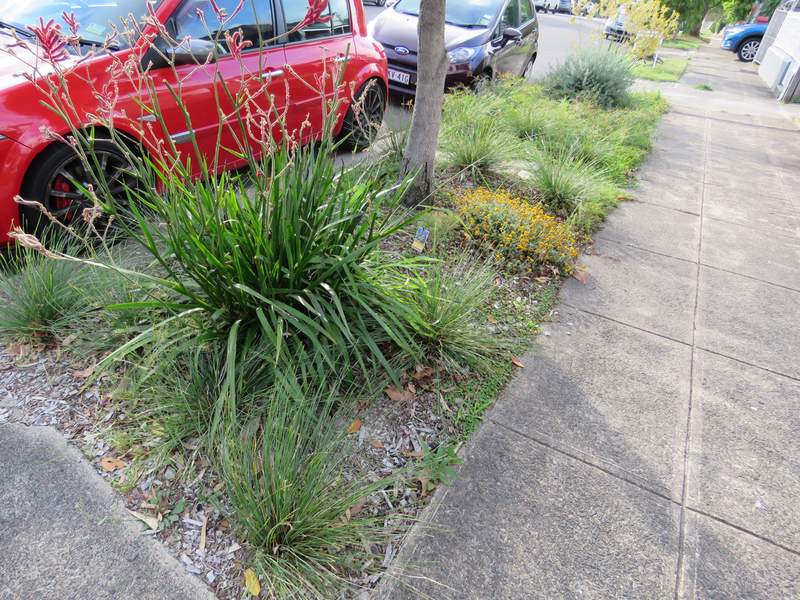 See – http://bit.ly/1oMD5WY This group of three verge gardens has really developed well & looks terrific. 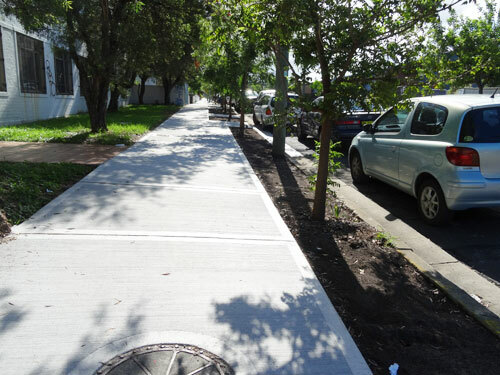 The impact of the streetscape is enormously positive. 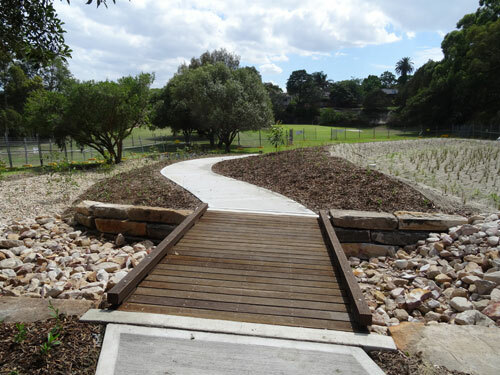 We visited another couple of long gardens along the railway line in Arthur Avenue Marrickville, which was a credit to the resident who created this. They add much beauty to an area that was inherently ugly. It’s now an area of habitat & really improves the streetscape. 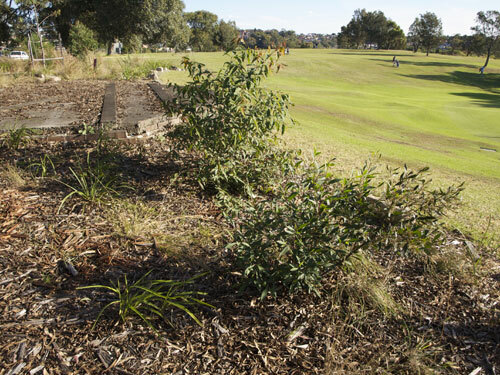 We also visited the 2012 National Tree Day site alongside Beauchamp Street at the Marrickville Golf Course to get cuttings of a particular plant whose name I forget. I wrote about this event, so you can see what it originally looked like – http://bit.ly/1vxGryQ I have posted photos of all three sites. The bus driver was a delight & really quite a motivating person. He has worked for Marrickville Council as a member of the team that looks after our streets for 26-years & obviously loves both the Council & the area. His is an undervalued job, but without clean streets & mowed verges our municipality would probably look neglected. These guys work hard all year round. The driver spoke about how much they need to clean the streets at this time of year when the deciduous trees start losing their leaves. If I remember correctly, one Marrickville street has to be cleaned three times a week while the leaves are dropping & a whopping 4-tonnes of leaves are collected every week. Unfortunately, the leaves are taken to landfill because of impurities such as car oil, cigarette butts & other types of litter. He mentioned that Council has some statistics on street cleaning, so I will request these & post about them later if I am allowed to have them. One other thing of interest is that Council is gradually changing the verge grass to a Soft Leaf Buffalo, as this species grows slower than other grasses. Maybe this is a good choice for our home gardens as well. We have Sir Walter in our garden & it is a lovely grass, but it does grow very fast. 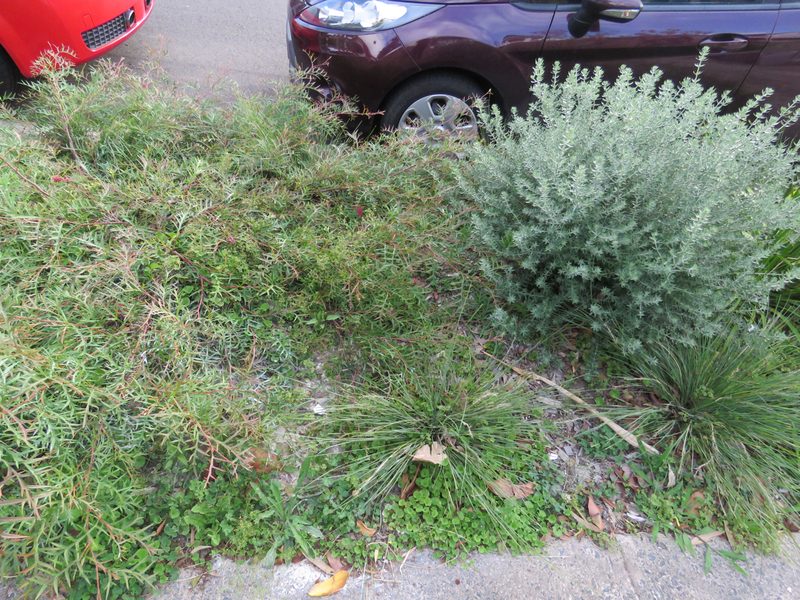 Marrickville Council spends $2-million per year to mow the verges, so verge gardens are a sensible option to reduce this cost. When we returned to the Nursery we prepared our cuttings & planted them. Council was quite generous providing us each with a plastic container with lid that acts like a mini-greenhouse. They also gave us a pair of secateurs & some decent gardening gloves each, as well as notes to refer to later. Preparing the cuttings was fun & also another opportunity to learn & be shown where you could improve on your technique. I had to redo mine, as I didn’t make my cuttings small enough. 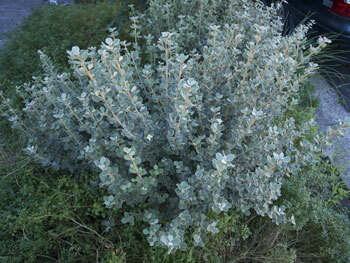 We each left the workshop with 24 new native plants that we prepared ourselves. Now we wait & care for them & hope that they grow. Those that do will be planted on the verge for the benefit of both the community & the wildlife. It was a really nice workshop – relaxed, fun & informative. I loved that we learnt about propagating native plants because I have always thought they would be more difficult to do than non-natives. Not so. Some cuttings might not be successful, but seeing what does work is part of the fun of propagating. It is a great way to keep costs down & of course a great way to share plants with neighbours & other verge gardeners. 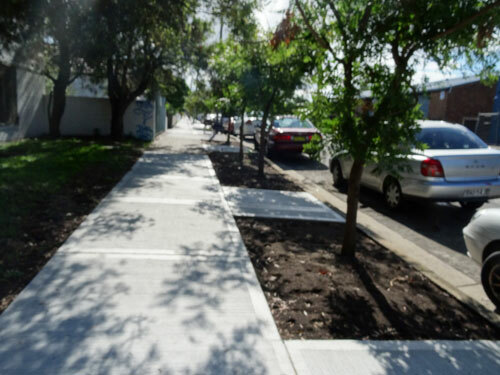 I thank Marrickville Council, the Sustainable Streets program & Ryde TAFE for this workshop. I highly recommend doing this workshop if you get a chance. You will gain confidence in a skill that will save you money & help you fill your verge & garden with plants that you have sourced & grown yourself. There has to be much satisfaction in that. Each little patch that gets beautified in our municipality will have a positive impact on everyone who passes. Our verge garden used to be the local rubbish dump. Now it is rare to find litter in this area as, on the whole, people respect beauty & the effort others have put in to making the streetscape nicer for everyone. The birds will move in as well, if you have planted with them in mind, & birdsong makes a place much nicer. 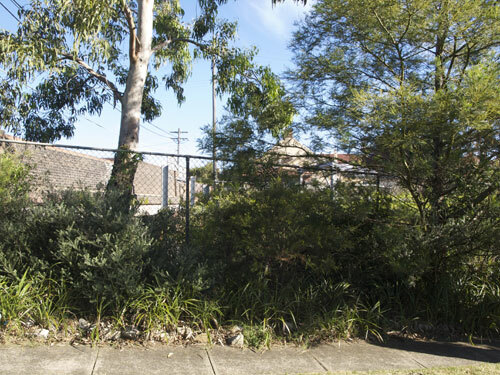 Two of the three verge gardens in Riverside Crescent Dulwich Hill. They look terrific & will look even better when the Weeping Lily Pily trees have grown. I was impressed. 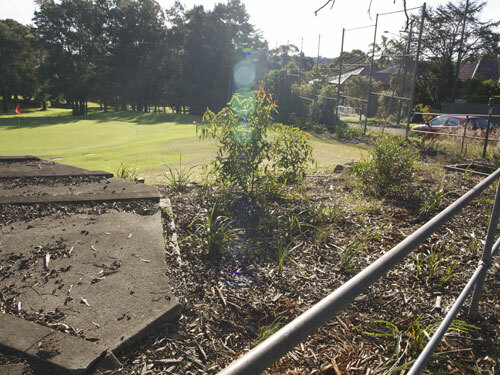 The 2012 National Tree day site in Marrickville Golf Course looking towards Bruce Street. 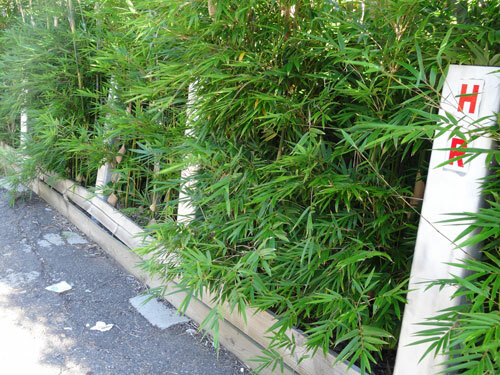 Bamboo to create a green wall. 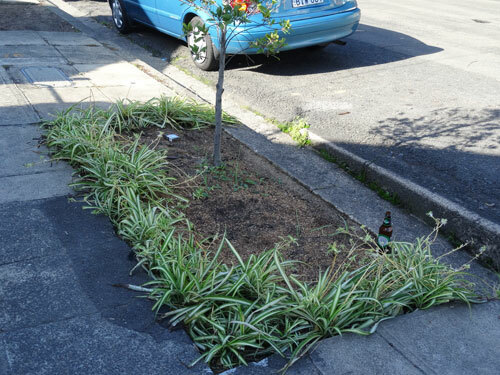 Last February 2014 some of the residents of Central Avenue Marrickville came together & planted an unusual & very effective verge garden as part of Marrickville Council’s Sustainable Streets program. 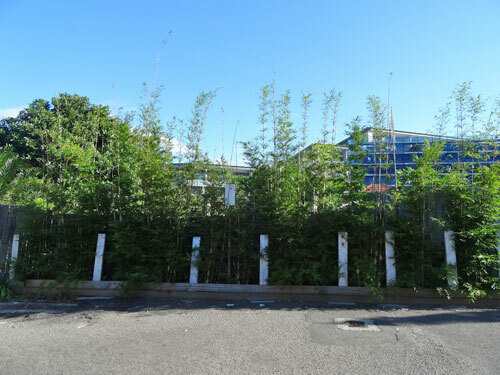 Non-invasive, clumping bamboo was planted along a fence line that is visible at the end of the street before it turns the corner. Instead of looking at wooden fences at the rear of three properties, residents now have a vibrant living green wall. Bamboo is the fastest growing plant on the planet, so this space should be looking even better in a few months. Bamboo has serious benefits in that it is great at stopping soil erosion & also sequestering carbon, which it locks up in the fibre of the bamboo as well as in the soil. Planting bamboo was a brilliant idea for this small space. I hope this idea is copied everywhere it can be. Already looking good. It will also block off some of the view of the highrise development at the old Marrickville RSL Club, which is the building in blue. Imagine these planted out. It could look very beautiful. The consistency & size of gardens looks better to my eyes, even without plants. 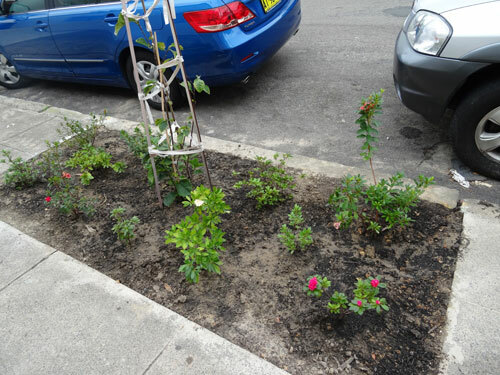 Marrickville Council created some new verge gardens in Albion Street Marrickville & they look wonderful. They are uniform in size & placed regularly along the street. They also provided a decent amount of room for the street trees. I imagine that once planted these gardens will look terrific & increase livability in this street. The benefits of verge gardens are vast & the benefits change with the type of plants used. At the very least verge gardens mean less concrete, which means a lowering of the urban heat island effect. Heat collected by concrete during the day releases somewhat during the night & this keeps nighttime temperatures higher than normal. We all know how hard it is to sleep on a hot night. Managing the urban heat island effect can mean lower power bills. 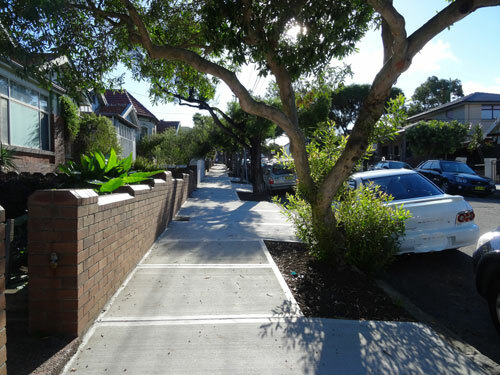 Cooler streets also result in a nicer environment to be in, whether it be in your house, in the front garden or walking the footpath. 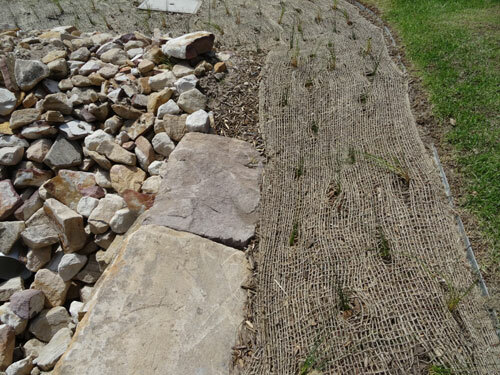 Verge gardens that are native or contain some native plants have a profound benefit to wildlife as food & shelter is available for birds, butterflies, other insects & lizards. Native plants at regular intervals provides a corridor of food, which is extremely important if you want birds & other wildlife to be part of your environment. Without exaggeration the birdlife increased ten-fold after we created our verge garden. Not all the plants are native, but most are. The other 10% were chosen because they would not be stolen & because they were bee attracting. It went from Currawongs & Indian Mynas being the dominant species to many different species of native birds, including little birds, visiting everyday. It sounds different now & can be quite raucous when a flock arrives to eat. Other benefits of verge gardens include a softening of the landscape, which is very good for the human spirit. The trees & plants collect particulate matter from passing traffic & therefore improve the air quality. 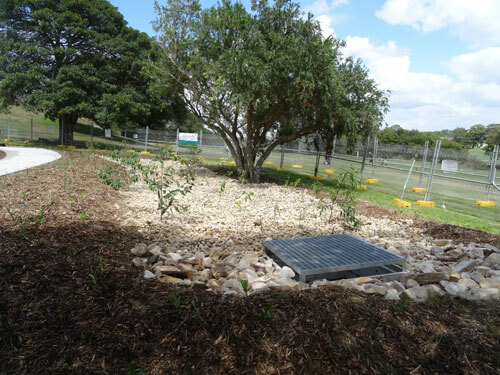 Verge gardens help to collect storm water & filter this water through the ground cleaning it before it enters the Cooks River. 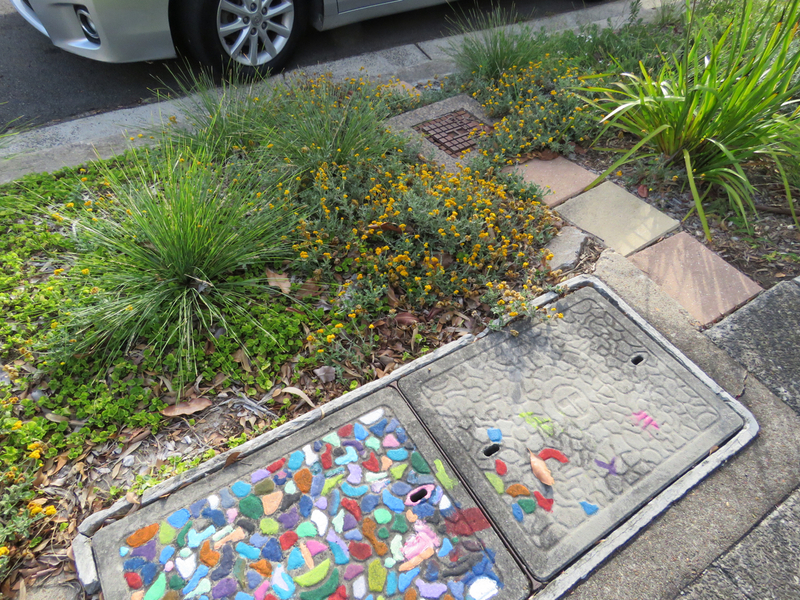 I remember reading in a Council document that the drains in Marrickville LGA have reached capacity, so any water that is collected naturally via the ground helps lessen the load of our drains & prevent flooding. Well-tended verge gardens raise property values in that street because of the beauty they add. They also reduce graffiti & increase safety because of passive surveillance of people out in the street. To me it is wonderful to walk along a street with verge gardens. It can look great, provide interest to the eye & I am always looking for beauty. It’s a way to learn about plants, what they are & what works well. It’s also a way to connect with nature without going to the park. Verge gardens can improve your mood to & from work, be a nice route to take your dog for a walk & it is always a great way to meet your neighbours. People are always happy to talk about gardens & plants. I know that the community, not just one’s neighbours, appreciates good verge gardens. 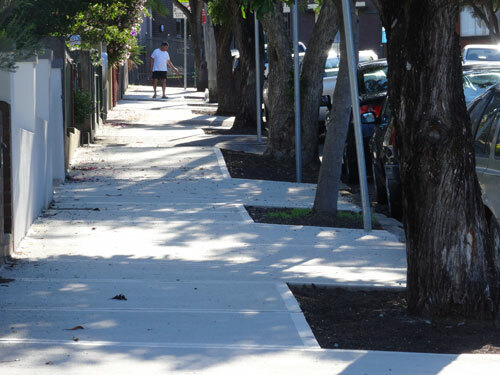 The footpaths of Marrickville LGA could be utterly transformed in ten years or so & we as a whole community would be much better off for this work. Looking good. The end of Shepherd Street that connects with Addison Road. 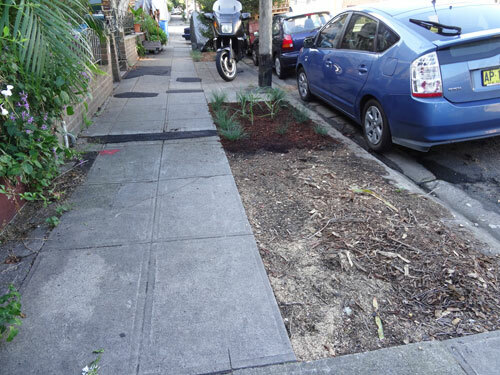 We went to look at the new verge gardens created by Marrickville Council in Shepherd Street Marrickville. Because the footpaths have not been replaced I assume this work was done on the request of residents. Planting has already started for some of the verge gardens & it looks terrific. Well done to everyone involved. We all benefit from this work. Someone has worked to improve the soil. This is a very nice large space to garden. 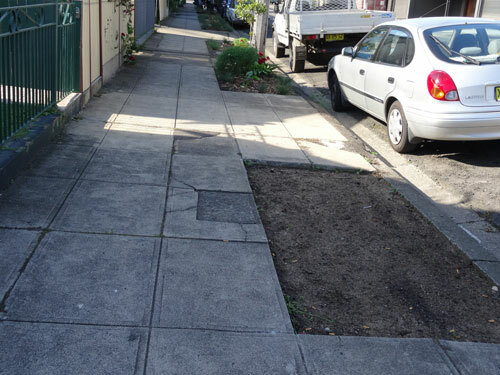 The potential for this section with soil on both sides of the footpath is great. 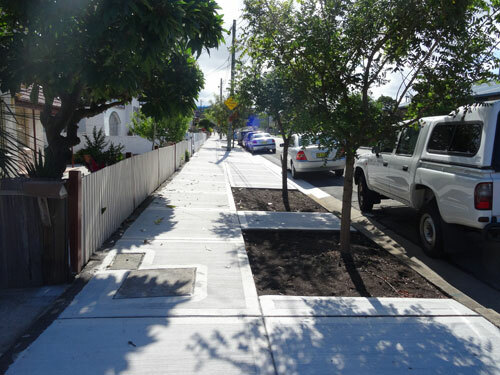 Marrickville Council recently replaced the footpaths in Myrtle Street Marrickville South leaving space for verge gardens. This is a wide footpath & the verge gardens will, in my opinion, greatly improve on the streetscape. 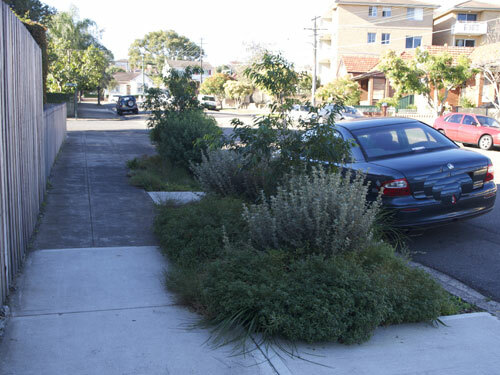 I love this approach by Council to leave verge gardens when replacing footpaths. I have no idea how long it will take to replace the footpaths of the whole of the municipality, but one day every street where this can happen will be transformed & what a positive difference it will make. Part of a very pretty verge garden in Marrickville. Incorporated is placemaking, permeable paving, bioswales, photocatalytic concrete that absorbs smog, solar/wind powered lights, recycled asphalt, stormwater management that collects roof water & directs it to the many bioswales & of course, beauty. These features are being incorporated into other building & street works across Chicago to create a more livable & attractive place with sustainability as a core aim. Incidentally, the City of Chicago has planted 600,000 trees over the past 20-years. Shepherd Lane in Newtown. I thought this was very beautiful & imagine that once it was just a driveway for cars. Looking down Shepherd Lane from the road. There is a raised dry stone garden bed & an attractive park bench here. On the left of the photo is the trunk of a big beautiful Gum tree. A turn down a dead-end-road just off Wilson Street in Newtown yesterday allowed me to notice the most fantastic laneway that I have seen in Sydney. 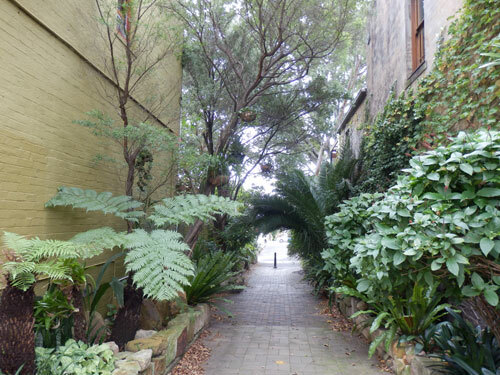 A part of Shepherd Lane travels between two 2-storey-terrace houses & is only about 30-metres long, but it is a very beautiful 30-metres. 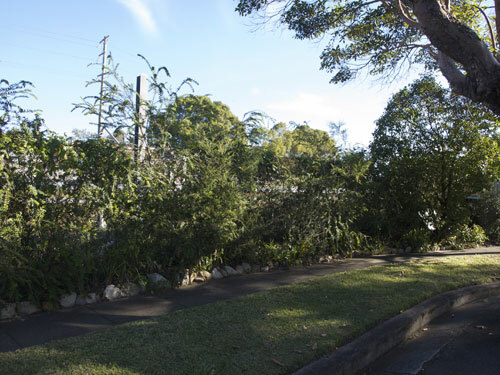 I have no idea whether the City of Sydney Council or the residents are responsible for the garden layout, building of the dry stone walls & planting of the lane – or both, but the Council must have given approval at sometime during the process. 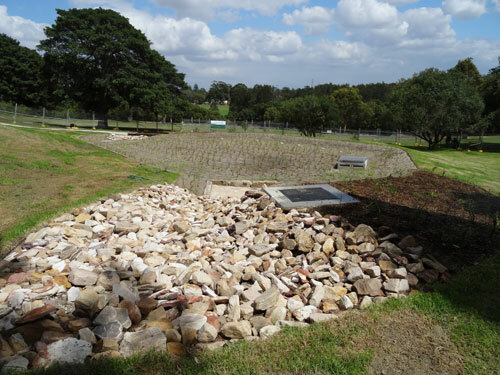 It is wonderful that such a place was created & supported by Sydney Council. Unusual to see a park bench on the street. It offered a great place to sit & look at the lane. People did come to do exactly that in the short time I was there. They came with their coffee made at home. My attention was initially grabbed by seeing a very nice park bench on the footpath at Wilson Street. It was only then I saw the green lane. The park bench is chained to a telegraph pole & sits in the dappled shade of a beautiful Gum tree. It has obviously placed to take in the view down Shepherd Lane. Behind the park bench is a raised dry stone garden bed filled with a range of plants, including succulents. It was clever thinking to add a bench in this location. It’s not common to see park benches on the street, except at bus stops. I’d like to see more of them, but they are ridiculously expensive. 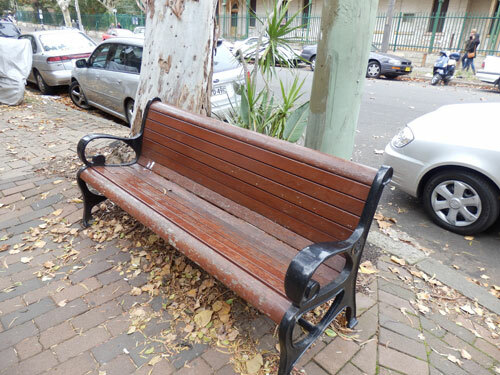 I’ve heard a quote in a Marrickville Council Meeting of $10,000 for a table with two park benches, so I would imagine a park bench would be upwards of $2,000. The quote was to install the picnic table on a street corner to encourage the older members of our community to meet. The park bench on Wilson Street was placed straight onto the footpath & chained in place to stop it being pinched. I imagine not laying a concrete base would have kept costs down. The chain itself does not present a trip hazard. Very attractive dry stone walls make up raised garden beds on both sides of the laneway. Some of the dry stone walls are straight, some are curved & there are places with plants either side to sit. 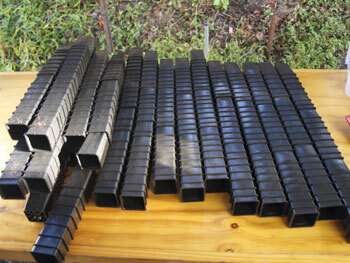 Interspersed are some pots of various sizes to break up the line & attract the eye. 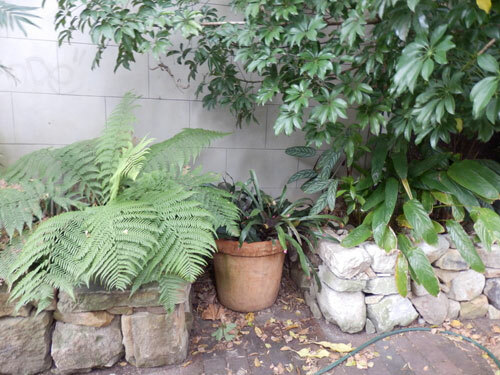 Being a shady lane between two terraces, they have planted shade-loving plants in layers, including tree ferns, bromeliads & bird’s nest ferns. It is a credit to the community these plants have not been stolen. 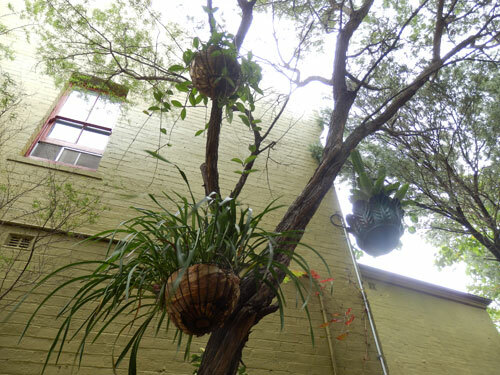 There is at least one good-sized tree with orchids attached to the trunk & many pots hang above from the boughs. It’s a good sight to look up & see more nice things come into view. 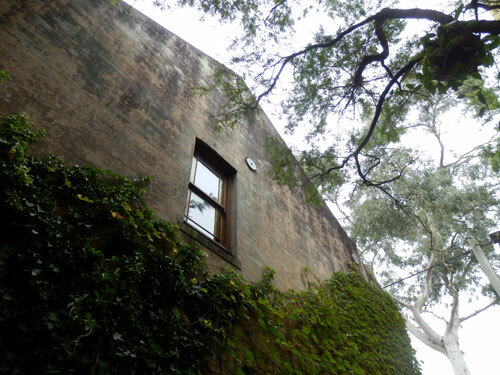 One of the terrace walls was filled with ivy. This would help keep the lane cool in the hotter months. I thought it looked very beautiful. The walls of both 2-storey terraces also are a feature of the laneway. One is covered in ivy, which in my opinion always looks great. It also has some potted plants on the wall. The other, an yellow-green wall, serves to highlight the trees & plants. 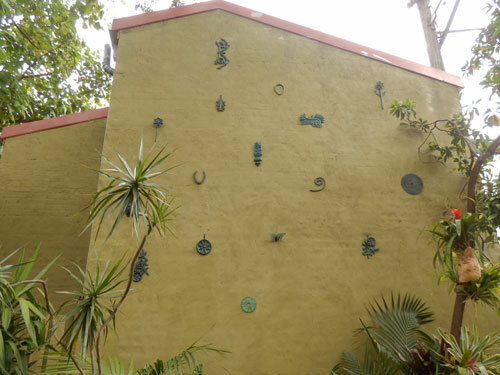 A number of metal artworks are attached to this wall creating an outdoor art gallery space. I was in a hurry so I will have to return to see what these were about. I noticed that the taggers have been, but their work has been painted over. It’s a busy lane. A number of pedestrians walked through in the short time I was looking around & a couple came & sat on the park bench to have a chat. It looked like they were staying for a while. I’ve seen this before in Newtown where residents leave their home/s & come to sit on the street because the leafy streetscape is quite beautiful. Last year one group of residents in this area of Newtown told me they do this often. They said it is a way to catch some sun, see friends & when they are thirsty, they nip into their house to make tea/coffee & bring it out onto the street to drink. This is placemaking that works. The first thing you need for successful placemaking, in my opinion, is good-looking street trees of a reasonable size. If the streetscape is green & beautiful, people will use it & it becomes part of their recreational activity. Once people come out onto the street, others naturally follow & they start to define the place by what they bring into it. Often this is some sort of seating & of course, plants. Most people like a green area & find it relaxing, even if they are not directly focusing on the garden. Shepherd Lane is beautiful. It is like a pocket park. It challenges the status quo of what a lane should look like & how the community uses lanes. Lanes can be so much more than drab ugly places where nothing is happening, except for the odd car passing through. What has been done here should be happening all over Sydney. The wildlife will benefit as will the community. 10/10 to the creators – you have set a standard that we could all aspire to. The raised garden beds on each side of the lane are dry stone walls. A variety of plants of all different heights added much interest. Here & there big & small pots were placed. Hanging pots graced the canopy adding another layer of interest & beauty. Space was cleverly used in this lane. One of the terrace walls was made into an outdoor gallery space. I loved this idea.